I would love to give you a photo of me and Raven and Jon I will go through my files of photographs and see what I can find hang on to be back in touch soon. Raven is an amazing animal ! Full of drive , really smart. Always fun and eager to learn. A sweet and loving member of our family. Thank you both for our girl! A Spell has adapted to Maine very well in such a short time. Her and VooDoo are doing quite well together. He is already very protected of her and so are we. She is truly a “JOY” to have. Her intelligence is remarkable and she is very quick to learn. 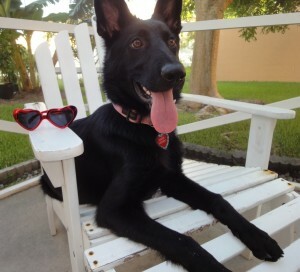 I have always had German Shepherds but she definitely stands out in her looks and intelligence. She was an excellent 1st time passenger in a car and when she needed to go potty ,she would scratch the door. She seems to be house trained ,withpout any over night accidents and that was in the first 24 hours alone. Not only is she incredibly beautiful, she has a very inquisitive mind, curious and safe at the same time and is constantly following VooDoo’s lead. THANK YOU so very much for allowing us to have her. She is worth far mor to us than what we paid. We will keep you posted. And feel free to add us to your testimonial page. Thanks again. I can’t tell you how much of a blessing Reilly has been, not only just for me but Mason and my family as well. He is such a handsome pup and his fur is dri-fit; he is swimming and solid white from sand, then he shakes and dry. He has followed Mason and I since day one and Mason seems to have reverted in age 5 years since Reilly arrived. The pictures attached are from when he was younger but he’s growing into an incredibly gorgeous dog. He’s a show stopper and people stop all the time when they see him. Thank you and your family for everything. Hope your Holidays are special and have a very happy new year. Everything with Xara is going absolutely great. She is a terrific girl. Wonderful disposition, intelligent, intuitive, very calm for a young girl,and isn’t afraid of anything. I don’t think she is fond of great danes though. 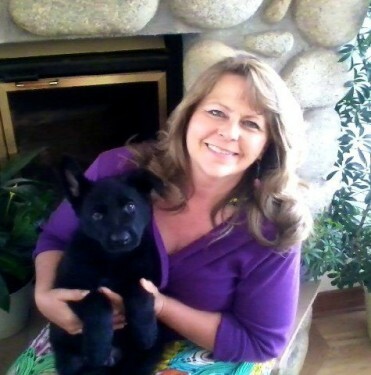 She went to her first puppy obedience class Wednesday at “Its a dogs world” in Sumner Wa. It’s more to train me than her. She did great. The gal who teaches the class, used to raise shepherds as guide dogs. So it should be a good fit for us. Xara is pretty much a rock star to anyone who meets her. Last night we had 15 people over for a birthday dinner, and she had perfect manners. She is just amazing and such an incredibly powerful runner. This reminds me of the wall paper photo on your facebook page. Suki and Xara are getting along great. Other than the first two days of snarling, its been wonderful. They play well together. Xara is an absolutely beautiful runner. In the 2+ weeks she has been part of the family, she has had only one accident in the house. The only destruction was she chewed a cheap pub mat style bar coaster, and she helped Thomas unwrap his birthday gifts last night. If he tore paper, she tore paper. It was cute. She likes to be right at my knee, and I like her there. I just absolutely love her. Thank you so much for recommending her to me. 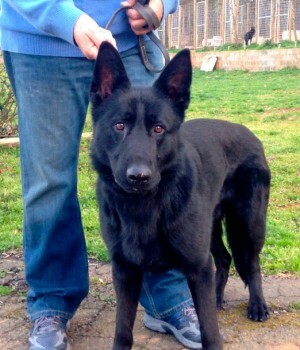 Our buying our first black german shepherd from Kennel von Wiese was truly a great experience. Debbie and her husband were very helpful in helping us decide which breeding pair would give us what we were wanting out of our puppy. With all of their dogs being fully titled and stunning in appearance it is hard to decide…you really can’t go wrong. At 11 weeks old Lucian has an unbelievable drive and is exceptionally smart. 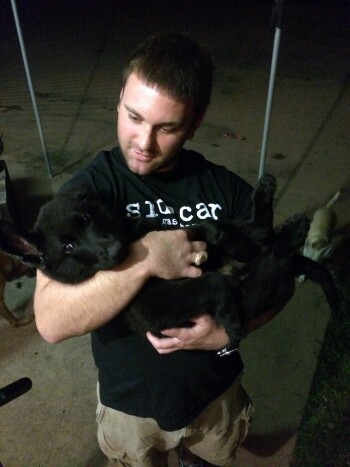 We expect great things from him and hopefully a Schutzhund title in his future. We will definitely be staying in touch with Kennel von Wiese for future purchases. My family could never be happier with our 1st experience getting a family dog. 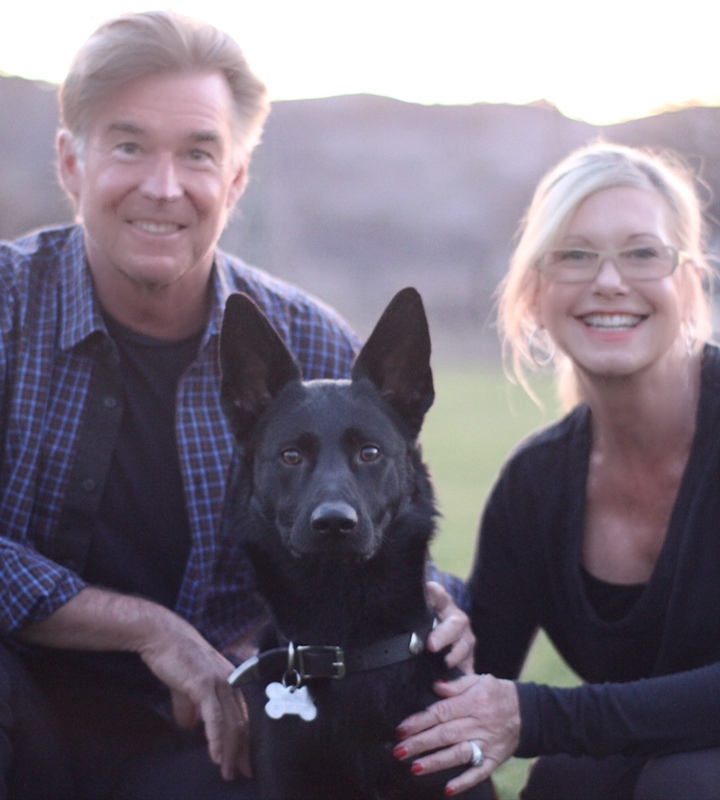 We have 3 children ages 9,7, and 5 and you were so accommodating and informative to us as well as educating our children about German Shepherds. Cleo has been an amazing addition to our family. 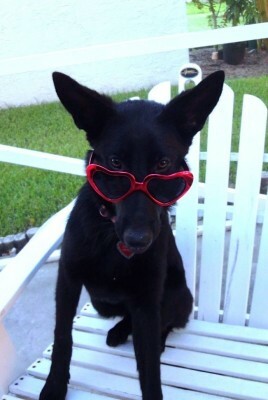 She’s not only beautiful but truly one of the smartest dogs we’ve ever seen. She is great with our children and it seems like we’ve had her for years and not months. Thank you Kennel von Wiese for making our experience one we will never forget. I just wanted to take a few seconds to say thank you for our newest addition Angel. She is almost 2 years old now and is just simply a delight. Her temperment, disposition, and personality are simply amazing. Angel gets alonog with our other two dogs wonderfully. She is easy to teach and quick to learn. We have her enrolled in professional training and will be pursuing a more intense training for her so that Angel will have security training (like her father) and possibly therapy training (hospitals/nursing homes). The sky is the limit with our Angel. We enjoy taking her with us everywhere and she always fits right in! Thank you for our beautiful Angel. We love her very much! A Very Grateful and Happy customer. Kennel von Wiese is a great place to introduce dogs into the world. Their being around all the other animals there has to be a big plus. Cam is not aggressive in any way. He is over eager to meet people, dogs, cats, and even horses. The Vet is really impressed with Cam as well. He’s a German Shepherd type person, and he readily expressed his impression of Cam as a very, very special dog. Cam lets him do what ever is necessary to examine him without a whimper. He doesn’t even flinch when the Vet gives him a shot. Cam is truly special. He is highly intelligent, and a fast learner. He has an admirable personality that has garnered him a host of friends. Cam has privileges that many dogs never get to experience because he is so special. He seems to realize that and shows his appreciation more and more everyday. 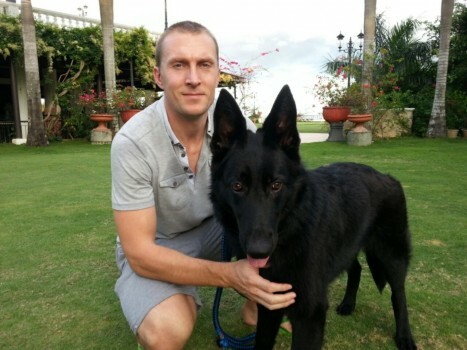 My experience with the purchase of my male German Shepherd from you guys (Kennel von Wiese, the Meadows) has been absolutely a fantastic and positive one and continues to be great. Our dog is not only a beautiful shepherd but also very smart and a quick learner. Potty training didn’t even take a week and he understands the consequences when he conducts bad behavior. We started obedience training soon after we took him home and at 4 months he could sit, lay down, shake and stay on command. He is a wonderful dog and a great companion. I would love to purchase another pup from The Meadows. It seems as if just yesterday we picked up our beautiful male puppy up at Logan Airport. 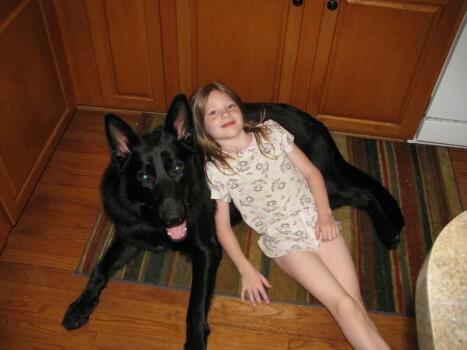 How nervous and excited we were to meet Gunner…would he like our two older female shepherds, ages four and six? Would we be able to handle three dogs? Five months later we are certain we made the right choice as you can see from these pictures. Gunner is part of the family! He is smart, loyal and so eager to learn from his older sisters. We are so thrilled with Gunner and the support you and your husband gave us, and we are considering purchasing another! We just wanted to update you on Apollo aka Duke. He is 5 months old today and weights in at 75 lbs. He is absolutely beautiful and just great. We are so happy to have him. He loves playing with our German Shepherd (Cai). Durward has been working with him every day. He learns quickly – very smart dog! Thanks again. Here is a picture of me with my Blackjack. What an incredible puppy! That’s all I can say. Thank you so very much! By the way, the trainer I’ve started with wants to talk to you. 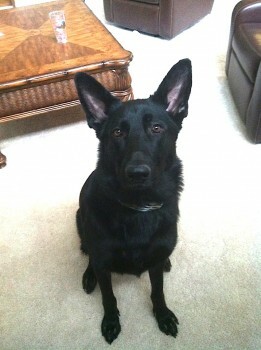 I emailed you in regards to Blackjack from your kennels that I am training and belongs to Mark Ramsey. In your reply email you mentioned having his sister who was a bi-color. I’ve checked on your web site and she is not listed. Would it be possible to see a picture of her? Although I am more interested in her drives for training and I am trying to get Import lines back into my breedings. My original Import Studs and DDR lined female are now retired. 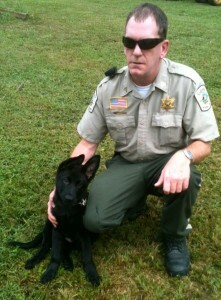 I breed for use by law enforcement and I am a retired handler. I know you are busy but when time permits would you please let me know her price if you are willing to sell her. I absolute am impressed by Blackjacks Intensity and Drives. His 1st day with me was So Impressive…I Thank you for your time sir. Just thought we would give you an update on Jäger (from Nara and Unkas). He is just wonderful and our family loves him so much. We have put him through one round of obedience training with a trainer who specializes in German Shepherds and he will go through another in a few months, only to ensure my kids have a better chance of handling someday. I plan to start the Buff K-9 soon, but just haven’t gotten around to ordering it yet. Just wanted to let you know how happy we were with our new addition to the family. Thought I would let you know that Rocky is doing very well and is fully integrated into the family. He continues to show exceptional drive and energy and I know you will enjoy great success if you can continue to breed Shepherds with his character, drive and power. He’s a winner from every perspective and there isn’t really a thing about him that has anything but exceeded our expectations. I believe we are going to work with him and get him titled. 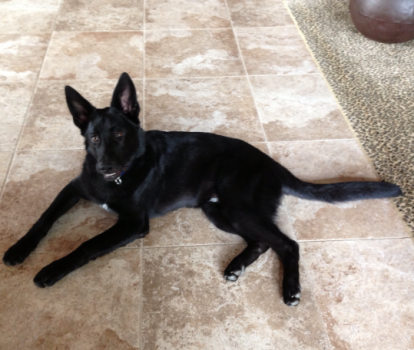 I am looking for an appropriate Schuzhund trainer in our general vicinity to work with. Again, just wanted to let you know how much we enjoy having Rocky. You can rest assured he has found a very good home. I still find it hard to believe that you sold him. He’s by far an incredible dog, even without his protection training. By the way, feel free to put these comments up on your website and use the video we shot. I just wanted to give a huge heartfelt thank you and your family for the incredible help and support that you showed us when we purchased our little baby Falco! The entire procedure was extremely smooth and easy, especially, since we were purchasing from overseas – all across the world in Hong Kong! We couldn’t have asked for a better breeder who strives for perfection and to give us complete insight and background information of Falco and his parents. 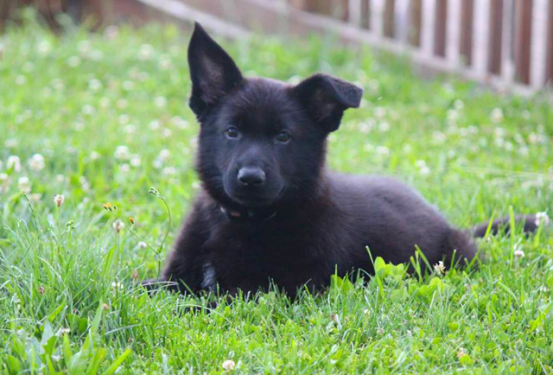 Every single description was completely accurate and true to its word, maybe even understated, and it really helped us greatly in making the decision of purchasing a puppy from your kennel. 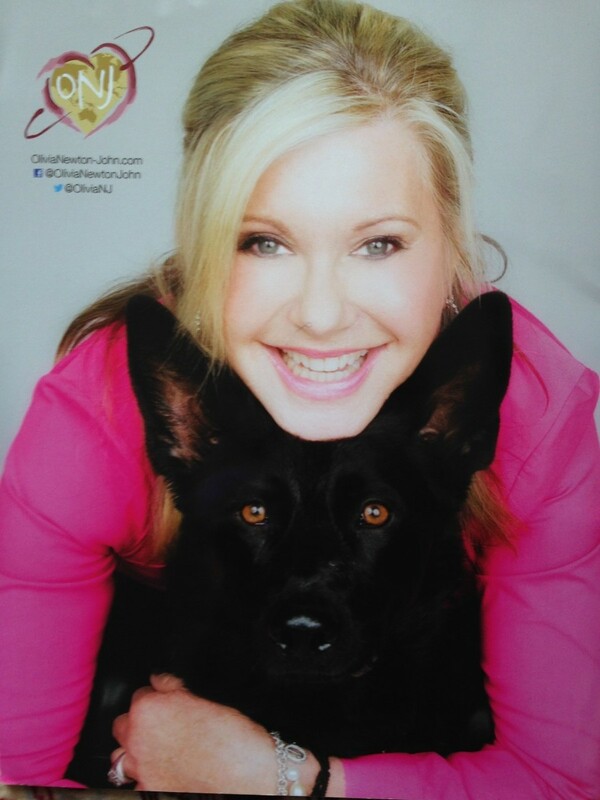 Thank you Kennel von Wiese for such a wonderful puppy! By the way, we are going to get another puppy from you, this time a female. God bless! My husband and I have always been dog lovers. 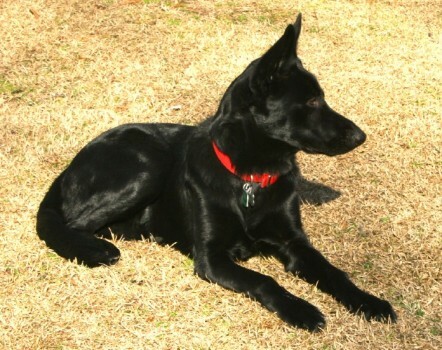 We had some experience with Shepherd’s, we had a black husky/shepherd mix “Matches” who we lost to cancer in 2009. That was the most significant death we ever had to deal with. She was a stray that we took into our home in 2002 …. she was hiding from the rain under my husbands SUV in our driveway. We still talk about “Matches” today … we always say that she found us. She was our gift and she brought us so much joy and showed us daily what a special gift she was. We always knew that we could not live without that kind of unconditional love in our lives. A few years later, we decided the time was right and started to do some research on-line. We knew we wanted a large breed dog. 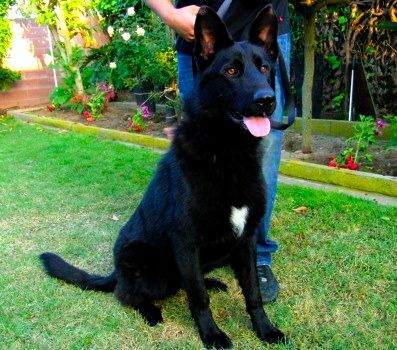 We were so fortunate to come across the Best Black German Shepherd Web-Site (Kennel von Wiese). That is when we fell in love again …. From the first time we saw pictures of Harrah (now Daisy), we knew she was the girl for us …. We were approaching our 21st Wedding Anniversary and thought that this would be the perfect gift to each other. One small problem … our house was under a complete renovation and we could not bring a new baby home until it was complete. Needless to say, we reached out to Debbie. 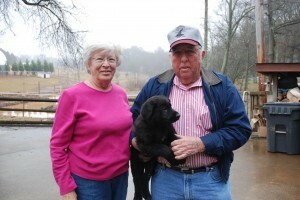 They graciously agreed to keep “Daisy” on their farm (Kennel Von Wiese – Meadows at Lake Norman) for a few more weeks until we were ready to bring our girl home. Then the day came … we met Daisy at the Ft. Lauderdale airport, it was required by Kennel von Wiese that we have Daisy checked out immediately by our local vet. She was PERFECT. Our hearts exploded with love …. The story should end here …. 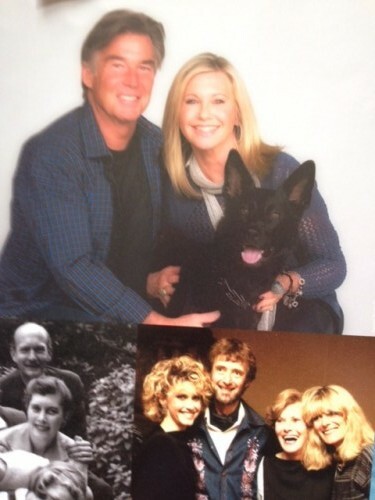 We never expected to hear from Debbie and Best Black German Shepherd Organization again. But the next day Debbie called to check on our girl. I am so happy to say that we have formed such a special bond with Debbie and her family ! We never had any question left unanswered. They love our girl like we love our girl. 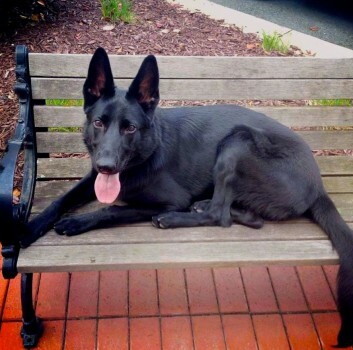 The breeding and the love from Kennel Von Wiese (Best Black German Shepherd at Meadows at Lake Norman) is without a doubt superior to any kennel we have ever been exposed to). Our girl is a Champion … the blood line is stellar and is ranked top in the world. Daisy is now 6 months old. She is beautiful ! We cannot go anywhere that people don’t ask about her and express how beautiful she is …. I should be a bit jealous as I was that special girl in my husbands eye’s but now there are 2 of us! 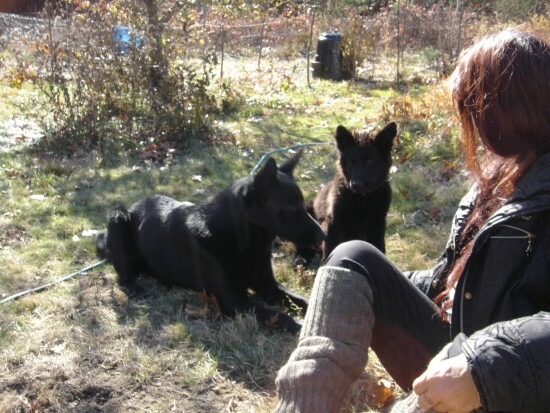 Our journey has ended here with the Best Black German Shepherd Organization …. we will never have another family member that wasn’t born to these amazing people. 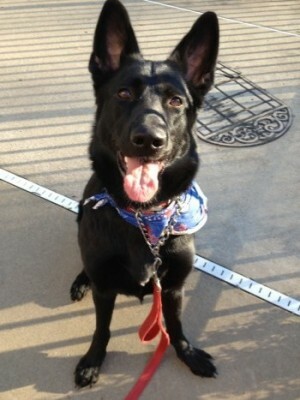 Thank You Best Black German Shepherds for our Baby Girl and for enriching our family and our lives. We will be forever grateful ! We are a family of 13, who also have bred European GSD’s for over a decade and a half. Because of our involvement with these dogs on a multiplicity of levels, we wanted to comment on several areas concerning [Kennel von Wiese’s] work with the breed. 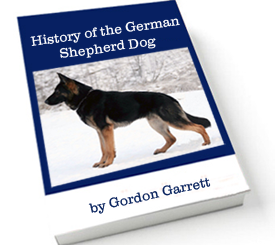 When promoting the modern GSD, it is imperative first and foremost to incorporate an exceptional genetic line. We found the lineage, quality, health and temperament of their dogs to be superlative to any other lines we reviewed in our search. Our interactions with [Kennel von Wiese] showed us they were informative, knowledgeable, ethical and kind. We had many requirements and expectations and can honestly say that they were met and surpassed at Kennel von Weise as we sought a new prospective sire for our own breeding program. In the realities of the breeding world, it is sad to say that the sale is commonly shadowed by duplicity and poor intent. All to often the exchange of commerce can diminish professionalism and integrity. We found this to be the polar opposite with our interactions with Dr. B. He was not only attentive to our specific inquiries and requests, but also took it upon himself to insure the best possible match for our unique needs. We do have one regret and that is that we did not find his program sooner. We can say with confidence that we will be working exclusively with them in the future. 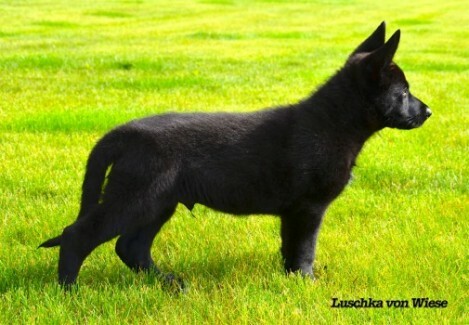 We whole-heartedly recommend that anyone looking for the best black GSD’s in sport, protection, service or family companions look no further than Kennel von Wiese. We are thoroughly smitten with Leviticus von Weise (Levi) born to Sire and Dam Nolan and Ricky, born on April 20, 2013. God Bless. 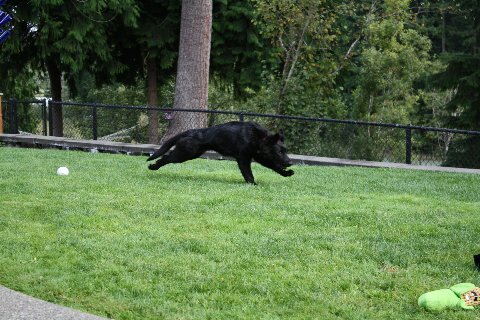 I read 4 books, viewed over 14 hours of training videos and interviewed about 5 different dog trainers before I decided to get Coco from Best Black German Shepherds. I wanted to make sure I was making the right decision for her and for myself. It turned out to be one of the best decisions I’ve ever made in my life. The amount of personal growth I have experienced over the last year and a half is truly priceless. Coco has taught me patience, commitment, hard work and the very definition of love. 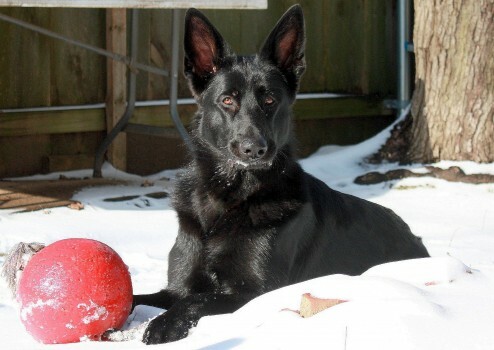 I have taught her a few things as well…Having an all black German Shepherd is a truly rewarding experience if you take the necessary steps to raise them right. You get what you give…a thousand-fold. Coco is a huge blessing to me and I’m so happy to have her in my life. Thought we would drop you quick a note to let you know how things are going. Luschka is doing extremely well in his new home. He seems very content and extremely happy.